Expanding homeownership and ensuring that homeownership remains affordable are critical priorities. We must also work to end homelessness and expand access to affordable housing for all Americans, especially for our veterans and their families. Today, Congresswoman Julia Brownley (D-CA) announced more than $2.2 million in federal funding through the U.S. Department of Housing and Urban Development Continuum of Care Program to help end homelessness in Ventura County. Today, Congresswoman Julia Brownley (D-Westlake Village) announced more than $8 million in federal grant funding for community development, homelessness, and affordable housing programs throughout Ventura County. Although Ventura County’s housing market has historically grappled with affordability issues, projects such as Ormond Beach Villas can help improve the situation, according to Rep. Julia Brownley, who spoke at the event. Today, Congresswoman Julia Brownley (D-Westlake Village) announced more than $6.1 million in federal grant funding for Ventura County and the cities of Oxnard and Ventura for community development, homelessness, and housing programs. Today, U.S. Representatives Mike Coffman (R-CO) and Julia Brownley (D-CA) introduced H.R. 4099, the “Homeless Veteran Families Act.” The bill aims to assist community agencies that help homeless veterans with dependents, with housing costs – thus helping keep families together. Today, Congresswoman Julia Brownley (D-Westlake Village) announced more than $1.3 million in federal grant funding for the cities of Camarillo, Simi Valley, and Thousand Oaks for community development programs. Today, Congresswoman Julia Brownley (D-Westlake Village) announced NeighborWorks America, a public non-profit established by Congress, has awarded a $415,333 grant to Cabrillo Economic Development Corporation to foster community development and create more affordable housing in Ventura County. Today, Congresswoman Julia Brownley announced 26 bills as part of her legislative agenda for the 115th Congress. 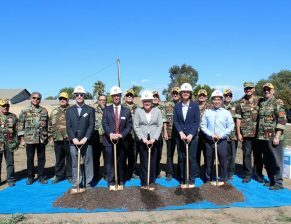 Today, Congresswoman Julia Brownley (D-Westlake Village) announced new tenant-based vouchers to combat veterans homelessness for the Cities of Oxnard and Ventura from the Department of Housing and Urban Development’s Veterans Affairs Supportive Housing program, commonly referred to as HUD-VASH. From the FY2014 appropriations for HUD-VASH, the City of Oxnard will receive tenant-based vouchers worth $61,678 and the City of Ventura will receive tenant-based vouchers worth $90,508. Today, Congresswoman Julia Brownley (D-Westlake Village) announced that the County of Ventura and communities across the region will receive nearly $7 million from the U.S. Department of Housing and Urban Development (HUD). Today, Congresswoman Julia Brownley (D-Westlake Village) announced that the VA has awarded the Salvation Army more than $1.7 million to help homeless veterans in Ventura, Los Angeles, and Santa Barbara counties. Today, Congresswoman Julia Brownley (D – Westlake Village) announced that the U.S. Department of Housing and Urban Development (HUD) and U.S. Department of Veterans Affairs (VA) awarded additional housing vouchers to the City of San Buenaventura to help homeless veterans transition into safe and affordable housing. The City of San Buenaventura received a $36,203 award, which will support 10 new HUD-VASH vouchers. Today, Representative Julia Brownley (D-Westlake Village) introduced the “Helping Homeless Veterans Act,” legislation to reauthorize homeless veterans programs. Today, Representative Julia Brownley (D-Westlake Village) announced the U.S. Department of Housing and Urban Development (HUD) awarded a $34,500 grant to the Housing Authority of the City of San Buenaventura for their participation in HUD’s ROSS Family Sufficiency Program. Funds will allow the Housing Authority to hire a program coordinator to connect local residents with training opportunities, job placement organizations and local employers.